This is actually pretty cool. As many folks as I know who have tattoos, I've never seen one actually inked before, so this was fascinating. Anyway, go take a look. The tattoo is gorgeous AND appropriately Halloweeny. Has America lost touch with the true spirit of Halloween? Speeding Muppets terrorize Bavarian motorways! 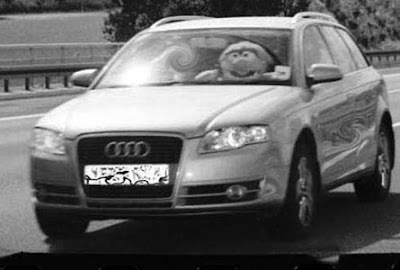 From my pal Sean Jordan over at G4's Attack of the Show, this hilarious story: Apparently German police are being stymied in their efforts to catch a notorious speeding motorist because when the automated cameras snap photos of the driver, he appears to be...a Muppet. Noooooo! David Tennant, say it ain't so!!! It's official: David Tennant is exiting the Tardis. Guest blogger Lou Anders: "Don't Be Good; Be Brilliant." There's a book on my shelf, taking up valuable space, that I just can't wait to throw away. I'm a collector, serious style. Brodart jacket protectors on all my hardcovers, don't touch anything without washing your hands, reading editions and archiving additions for special titles -- that's how serious. So what's this about wanting to throw a book away? Well, I'm also a very occasional writer, and like a lot of you, I've got that one title that once made me go, "If this can get published, anything can. Heck, I can write better than this crap." So it's there, on the shelf, waiting for me to actually finish a novel, at which point I get to reward myself by tossing it in the trashcan where it so clearly belongs (and no, I won't tell you it's title). But until then, an author with a finished novel, even a terrible one, is still one novel ahead of me, and so there it sits. Now, obviously there are bad books out in the world. Lots of them. But taking off the wannabe author hat, and putting on the editor one, the truth is that the way to get published is not to aim for being slightly better than crap. As the editorial director of Pyr Books, I get pitched books anywhere from three times a week to three times a day. I read hundreds of manuscripts, partials, outlines, proposals. I probably sift through a hundred possibilities for every one good book. And while you might think that the vast bulk of what gets rejected is unreadable drivel that's easy to dismiss, that really isn't the case. The truth is that most of what comes in is perfectly competent. Stories with an interesting protagonist with a clear motivation, on a journey with a definite beginning, middle and end. The problem isn't that it's full of problems. The problem is that it's competent, okay, decent, moderately well-executed, perfectly servicable... You get the idea. To stand out from this sea of submissions, you need to sparkle. You need to be un-put-downable. As jaded as editors are, you need the manuscript that makes you want to grab the phone immediately to call your spouse, boy/girlfriend, best friend because you can't wait to talk about it, the manuscript that has you leaping out of your chair because you've got to do something to disperse the energy that's rushing off the pages and into your heart. You need to be brilliant. That might sound discouraging. It shouldn't be. Yes, it's a lot harder to be brilliant than to be merely competent. But you know what - when you are brilliant, it's a lot harder to resist as well. I truly believe that everything brilliant finds its way eventually. Because as jaded as we editors can be, we like getting excited by a book as much (or more) than anyone else. So instead of keeping that book on the shelf until you've earned the right to throw it away, maybe we should all throw away our "I can do better than this" books. Maybe the shelf should only contain things to aspire to, not works to excel but works to equal. What a library that would be. Next up on my list of Swivet guest bloggers is Lou Anders, Editorial Director of Pyr Books, the SF/F imprint of Prometheus Books. Lou will be popping in every now and then to talk about publishing from an editor's perspective, as well as giving commentary on the state of genre publishing as a whole. Lou has an impressive background in genre publishing. He is a 2008/2007 Hugo Award nominee, a 2007 Chesley Award nominee and a 2006 World Fantasy Award nominee. In addition to running Pyr Books, he is the editor of the anthologies Fast Forward 2 (Pyr, October 2008), Sideways in Crime (Solaris, June 2008), Fast Forward 1 (Pyr, February 2007), FutureShocks (Roc, January 2006), Projections: Science Fiction in Literature & Film (MonkeyBrain, December 2004), Live Without a Net (Roc, 2003), and Outside the Box (Wildside Press, 2001). In 2000, he served as the Executive Editor of Bookface.com, and before that he worked as the Los Angeles Liaison for Titan Publishing Group. He is the author of The Making of Star Trek: First Contact (Titan Books, 1996), and has published over 500 articles in such magazines as The Believer, Publishers Weekly, Dreamwatch, Star Trek Monthly, Star Wars Monthly, Babylon 5 Magazine, Sci Fi Universe, Doctor Who Magazine, and Manga Max. His articles and stories have been translated into Danish, Greek, German, Italian and French, and have appeared online at SFSite.com, RevolutionSF.com and InfinityPlus.co.uk. I'm thrilled that Lou has agreed to guest blog at the Swivet! Please welcome him! Sad news for Tony Hillerman fans. He was a wonderful writer. If you've never had a chance to read any of his Joe Leaphorn and Jim Chee books, mystery novels that also served to introduce the cultures and traditions of the Navajo people, I can't recommend them highly enough. Edit to add: Sarah Weinman has a good round-up of tributes to Hillerman from around the web. So, how many of your characters have blue eyes? I've noticed a trend in many of the partials I've been reading: a whole bunch of your characters have blue eyes. I mean a whole bunch. Which is more than a lot. And I see lots of variations on the blue: cerulean, silver blue, robin's egg blue, dark blue, light blue, pale blue, azure, indigo, aqua, navy, cyan, cobalt and ultramarine. Many of you seem to using blue eyes as a signifier that your protagonist is different somehow. Special. Unusual. I'm not saying that you should never have a blue-eyed character. But you might want to try having your characters reflect all of the magnificent colors of the human (or dwarf or elf or vampire or werewolf) spectrum. PS: You want to give your character really unusual eyes? Try green. It's actually the rarest eye color among human beings. More on the importance of stripping books. Bookseller Chick, a wonderful blogger who was also a longtime bookseller in the Portland area, points readers to an older post of hers wherein she discusses the importance of stripping, and why a bookstore wouldn't stay in business very long without it. Does the New York Times bestseller list discriminate against graphic novels on the hardcover fiction list? The answer is yes, absolutely. And they actually admit to doing it. Loved to death: On book-stripping and why some book lovers shouldn't be booksellers. As a follow-up to Andrew Wheelers excellent post about bookstore economics and why some indie bookstores deserve to die, novelist J. Steven York posted his own thoughtful examination of how one local indie bookstore in his own neighborhood died because the owners literally loved their books too much: they refused to return books or strip out old paperbacks for store credit. One of the things that York sheds light on in his post is the very odd publishing practice of "stripping". For those of you who have never worked in a bookstore or a retailer that sells magazines and books, "stripping" is the practice of tearing off the cover of a magazine or mass market book to return to the publisher for credit. (Newspapers, on the other hand, usually only have their mastheads stripped off and returned.) The idea is that the retailer returns the cover and receives credit for the entire book as a return (usually about 48% to 52% of the cover price). Returning only the cover saves the cost of postage and freight fuel, but is terribly wasteful of paper. Theoretically the remainder of the book or magazine is then recycled or destroyed, but in reality what usually happens is that the books are donated to hospitals, prisons, or schools. Sometimes the store leaves the mutilated books in a "Free Books" box out front. And sometimes they just get tossed. Not all books get stripped, by the way: only mass-market and some digest-sized kids chapter books. Trade paper and hardcovers are returned whole, restocked and then resold later. You'd think that publishers would want the stock back in order to resell it, right? Wrong. It actually costs more for the publisher - in terms of time and labor - to have their warehouse folks physically restock the books, especially if the returns are not for full, unopened cartons. In any case, I encourage you to read York's entire post. X-ray your own hand with Scotch tape! NEW YORK – Just two weeks after a Nobel Prize highlighted theoretical work on subatomic particles, physicists are announcing a startling discovery about a much more familiar form of matter: Scotch tape. It turns out that if you peel the popular adhesive tape off its roll in a vacuum chamber, it emits X-rays. The researchers even made an X-ray image of one of their fingers. Genevieve Valentine on ten fantasy films that ruined it for the rest of us. Over at Fantasy Magazine, Genevieve Valentine gleefully skewers ten of the worst fantasy films ever made. If you're a film fan (or if you've ever spent a miserable sick day in bed forced to watch an endless stream of SciFi Channel-produced made-for-TV classics such as Mansquito or Frankenfish) and you aren't regularly reading her regular columns at Fantasy Magazine (as well as her hilarious Questionable Taste Theater posts on her personal blog), well, you're seriously missing out on some of the funniest movie eviscerations critiques ever written. Garrison Keillor on the future of Sarah Palin. It was dishonest, cynical men who put forward a clueless young woman for national office, hoping to juice up the ticket, hoping she could skate through two months of chaperoned campaigning, but the truth emerges: The lady is talking freely about matters she has never thought about. The American people have an ear for B.S. They can tell when someone's mouth is moving and the clutch is not engaged. Colin Powell doing the right thing. Excellent essay on the economics of the bookstore, and why some books get skipped by buyers. Those of you reading this blog who work in the book industry know may know my friend Andrew Wheeler, the former senior editor for the Science Fiction Book Club, now a marketing manager for John Wiley. He's one of the more astute observers of the book industry and keeps an excellent blog where he often posts excellent critical - and informative - essays on why things are the way they are in publishing and bookselling. If you don't have a background in bookselling or publishing, his blog is a great place to start if you'd like to understand the business better. But bookstores are businesses, not public conveniences. No store has the responsibility to carry every book published -- although, to be honest, that's a straw-man argument, since no one is asking for that. (They're just wishing that their books, the books they like, and the books by their friends be spared the chopping block.) I market books for a living, so I can tell you an unpleasant truth: the order for any book, from any account, starts at zero. The publisher's sales rep walks in the door with tipsheets and covers, past sales figures and promotional plans, to convince that bookseller's buyer to buy that book. In many categories -- SFF is still one of them -- the chain buyers say "yes" the overwhelming majority of the time. But not all the time. Sometimes, that buyer is not convinced, and the order stays at zero. He effectively breaks down the economics and the thought-process behind the decision to carry a sequel to a first book whose sales were disappointing. As a former book buyer for an independent store, I often skipped titles whose predecessors didn't sell (or "turn") well enough to merit giving the author additional shelf space. It's purely a business decision: the number of new titles divided by the linear feet available. As someone who worked in independent bookstores in the San Francisco Bay Area from 1984 through 1999 and who has always been an outspoken supporter of the independent bookselling community, I couldn't agree more with the above paragraph. People are often quick to blame Amazon or chain bookstores for the downfall of the independent booksellers, but a closer look at the history of individual stores often tells another story. In any case, Andrew provides much food for thought and you can read the entire post here. Over at Random House's Suvudu blog, Del Rey Editor-in-Chief Betsy Mitchell has posted a great piece on why smart writers shouldn't argue with their editors when asked to make changes. Be prepared to familiarize yourselves with the awesome phrase: "The ego has landed". From the Department of WTF: How the Bee Gees could save your life. No, I'm not saying the Bee Gees will save your life. The American Heart Association is. Apparently the song Stayin' Alive has the same rhythm as the chest compressions needed to re-start your heart, so they're using it as a training tool in CPR classes. Thank God it's the song Stayin' Alive, and not the film. John Travolta's shaved, sweaty chest and mullet might have the reverse effect on a dying person. Guest blogger Courtney Summers on how rejections can be a positive thing. So when I first started writing and querying agents, I was pretty much prepared for the constant rejection that would follow. This is because I was unpopular in middle school and middle school rejection made an agent looking at my e-query and replying with a polite, no thanks, almost, but not quite, as easy to swallow as the ~*amazing*~ pumpking pie I had last weekend (I hope you Canadian Swivet readers had a Happy Thanksgiving!). What I wasn't prepared for was the way certain rejections would positively and majorly impact my adventures in writing. And I didn't always realize it at the time because not all of those rejections were positive experiences. Rejections can be total Dream Destroyers, yes, but sometimes they can be--trite as this sounds--a gift. Gifts disguised as Dream Destroyers, even! The first important rejection I received was from one of the first three agents I queried for my first novel (which might've been women's fiction about a directionless 20-something, but was definitely a mess). She requested a partial. I sent it off to her and dreamed of that partial request turning into a request for a full. I did not anticipate opening up my inbox and being told that I wasn't ready for an agent. What. I stared at that line in the email for so long--feeling stupid and embarrassed--that it took me a while to see the "But." But? "But," the email said, "You will be." Below that was her phone number. She wanted to arrange a talk. Later that week, I found myself having a 30 minute conversation with a literary agent who told me I wasn't ready for representation, but I could be, it wouldn't happen with this book, that it would probably take years and it would be a lot of work, and what was required of me to make it happen. I remember hanging up the phone feeling like the whole thing was totally beyond me until I realized at least one person in the industry didn't think it was. That was a lucky first time out, I admit, but that agent expressing a certainty that it would eventually happen was something that kept me going when I wasn't feeling so certain myself, and her rejection gave me the courage to let go of my first book and write my second. My second novel (featuring a younger directionless 20-something, and only slightly less of a mess than the first) brought about many, many rejections from agents, and none of them said too much about why they were passing, which never bodes well. Finally, one agent tacked a note onto their no that changed everything. It said, "Sorry, but I don't handle borderline YA." After I read that, I swear I left a dent in my forehead, I smacked it so hard. Without that agent's rejection, it might've taken me at least 10 more years to figure out what I was meant to write. Seriously, I'm pretty slow on the uptake. My third novel was a high-concept YA (yay YA! ), except, tired of rejection, I decided to write to what I thought the market wanted, even though I wasn't really feeling it. This novel garnered a lot of interest. An agent emailed me, loved the book and wanted to talk about it. We had a great phone call. She had revision suggestions. I liked them. She had more. She said she'd write up a revision letter and if I agreed to it, we'd go forward with representation. I notified other agents of the interest and they bowed out, but that was okay because I was 99% sure I had an agent. I waited on the revision notes. And waited. And waited some more. I sent 'what's up?' emails. They went unanswered. The new year came. Just when I had completely given up, the agent emailed me... to let me know she was leaving the business and was sorry we wouldn't be working together. It didn't feel like it at the time--I was devastated--but after I regrouped, I realized not getting that agent was one of the best things to happen to me. I didn't want an agent representing that book; one I wasn't really in love with and one I couldn't write again. I decided the next novel I wrote was going to be a total uhm... balls-out experience and it was going to be everything I wanted it to be. Without that agent's rejection, I might not have written that novel. That novel was Cracked Up to Be. So that's why the agents I didn't get were as important as the ones I did. Their rejections made a large impact on my writing life and without their 'nos', I truly believe I would have never gotten my agent's 'yes'. Consequently, I'm totally one of those writers who believes every 'no' brings you closer to a 'yes' (if only we could all know how many 'nos' before that yes, though! ), and I've decided this holds true not only in writing life, but in life-life as well. Like, I am SURE if I just keep asking Jeff Probst to marry me he's gonna have to give at some point. How about you, Swivet readers? Have you gotten a rejection for your writing that made a positive impact on it? I've been given some heat by the Peanut Gallery for not giving Buddy-Cat as much face-time as Stinkyboy. Mostly it's because he's just not as neurotic as Stinky. He's also hard to photograph, being that he's a black cat and the only camera I own is the crappy little 1.3 megapixel thing affixed to my cell phone. 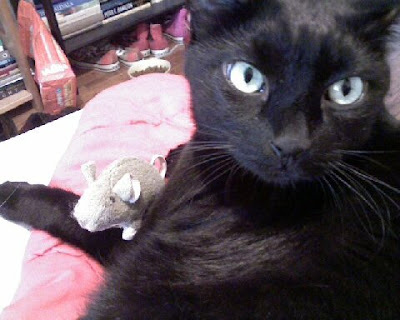 All that being said, here's a picture of Buddy-Cat with his Teddy Mouse. Yes, his Teddy Mouse. That he sleeps with. There! Happy now? Oh, dear. My cat has a wubby. It started off innocently enough: a Mexican blanket that had been on the back of the sofa was now mysteriously on the floor. I put it back, thinking maybe it had slipped off the sofa. The next day, the blanket was on the floor again. Hmmmmm.... How odd! This morning I wake to find Stinkyboy wrestling with the Mexican blanket, yanking it off the sofa and then dragging it into my bedroom to the foot of my bed. Once he'd gotten it situated, he promptly curled up on it and went to sleep. Yes, folks. My cat has a wubby. Brief hiatus for wedding stuff. I'm thrilled about seeing them both after so long without a trip back the West Coast. I'm equally thrilled that this is an informal wedding, because I do so hate dressing up and my sense of sartorial splendor is sorely lacking. In any case, I'll be back online sometime on Monday or Tuesday. See ya! Fidgeting with template. Pay no attention, please. "Thirty two flavors, all of them vanilla" or, Ivy retardation. Via Justine Musk, a link to this interesting piece in the American Scholar about the intellectual disadvantages of attending an Ivy League school, or what the author calls "Ivy retardation". "But it isn’t just a matter of class. My education taught me to believe that people who didn’t go to an Ivy League or equivalent school weren’t worth talking to, regardless of their class. I was given the unmistakable message that such people were beneath me. We were “the best and the brightest,” as these places love to say, and everyone else was, well, something else: less good, less bright. I learned to give that little nod of understanding, that slightly sympathetic “Oh,” when people told me they went to a less prestigious college... I never learned that there are smart people who don’t go to elite colleges, often precisely for reasons of class. I never learned that there are smart people who don’t go to college at all." "It didn’t dawn on me that there might be a few holes in my education until I was about 35. I’d just bought a house, the pipes needed fixing, and the plumber was standing in my kitchen. There he was, a short, beefy guy with a goatee and a Red Sox cap and a thick Boston accent, and I suddenly learned that I didn’t have the slightest idea what to say to someone like him. So alien was his experience to me, so unguessable his values, so mysterious his very language, that I couldn’t succeed in engaging him in a few minutes of small talk before he got down to work. Fourteen years of higher education and a handful of Ivy League degrees, and there I was, stiff and stupid, struck dumb by my own dumbness. “Ivy retardation,” a friend of mine calls this. I could carry on conversations with people from other countries, in other languages, but I couldn’t talk to the man who was standing in my own house." The Sarah Palin debate flow-chart. New ocean growing in Africa? First the earth starts farting. Now it's apparently splitting in two. Death of an indie bookstore: Olsson's shutters its doors after 36 years. A friend and former Random House colleague of mine, Ann Kingman (who now runs the wonderful book blog Books on the Nightstand) sent me this news: The Beltway's oldest indie bookstore, Olsson's Books and Music, has closed it doors. Olsson's was a beloved fixture in the Washington DC area, a small family-run chain of indie bookstores with a loyal following. When I was a publicist, I loved sending authors to Olsson's. I especially loved sending my Star Wars authors there, because they were treated like royalty, and the event managers there always knew how to put on a great show, with costumed characters and media coverage. Unlike a lot of indie bookstores I'd pitch to, the folks at Olsson's never turned up their collective noses at my genre and movie tie-in authors, and it showed in the wonderful events they produced every time I sent one of my guys down there. They were always professionals and made the authors feel at home; I respected the hell out of them for that. Anyway, if you have your own fond memories of Olsson's, you can leave a message for them here.